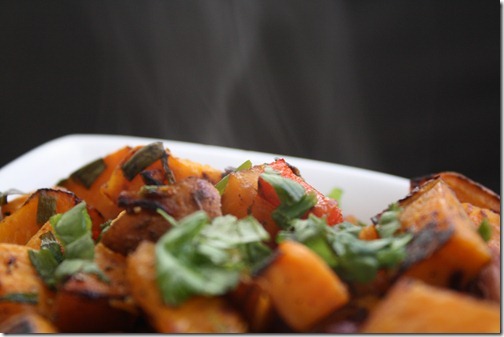 Regardless of season, sweet potato is always a fixture in my kitchen. I love it in smoothies and juices, mashed, fried, baked, sautéed, hot, cold, etc. One of my favorite breakfast dishes growing up was hash browns. This recipe is a healthier, less sugar-spike-friendly version of regular hash browns. 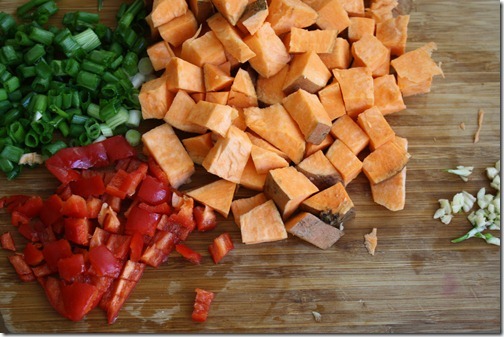 I diced the potato, but you could very well grate or julienne them. 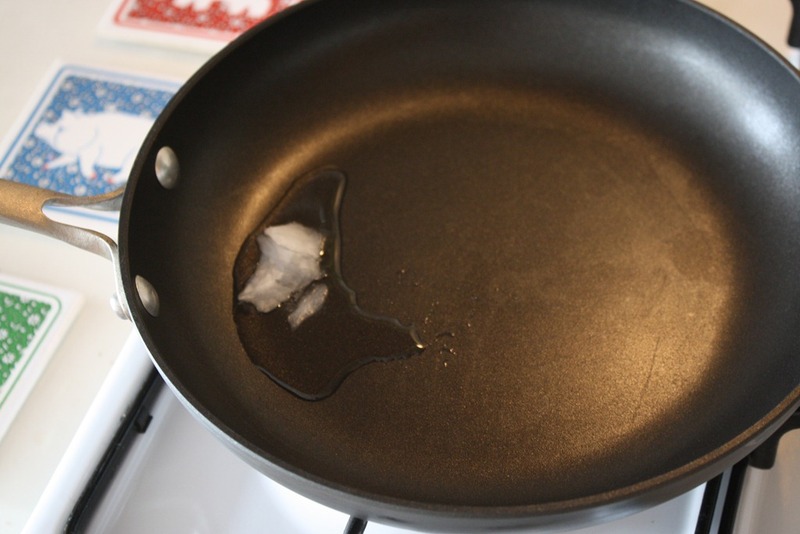 I also used coconut oil as the fat. The result is savory, sweet, fragrant, light, and comforting all in one. 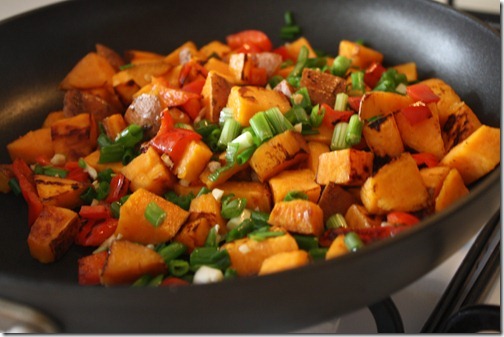 Dice the sweet potato, scallions, red pepper, and garlic. 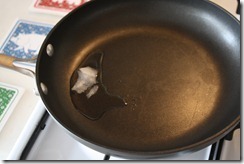 Melt coconut oil in a medium saucepan over medium-high heat. 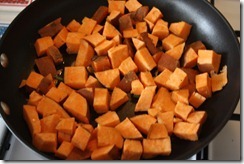 First add the sweet potatoes, since they will take the longest to cook. 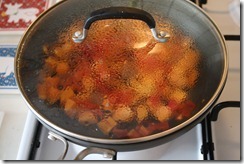 After one minute, add the red pepper, salt and pepper. 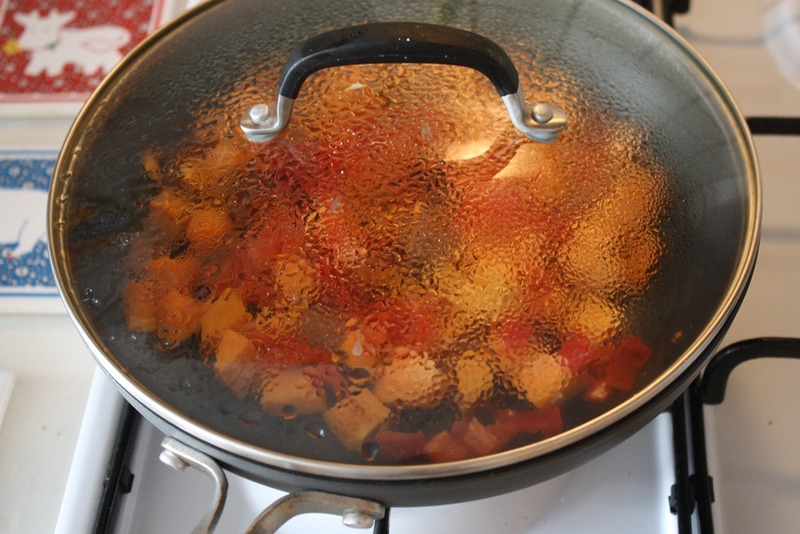 Put a lid on the saucepan to help steam the potatoes. Three minutes later, add the scallions and garlic. Toss so that all is evenly combined. 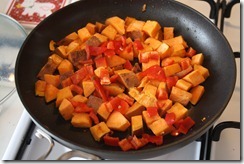 Cook for several more minutes until the sweet potato is tender. Serve and enjoy! 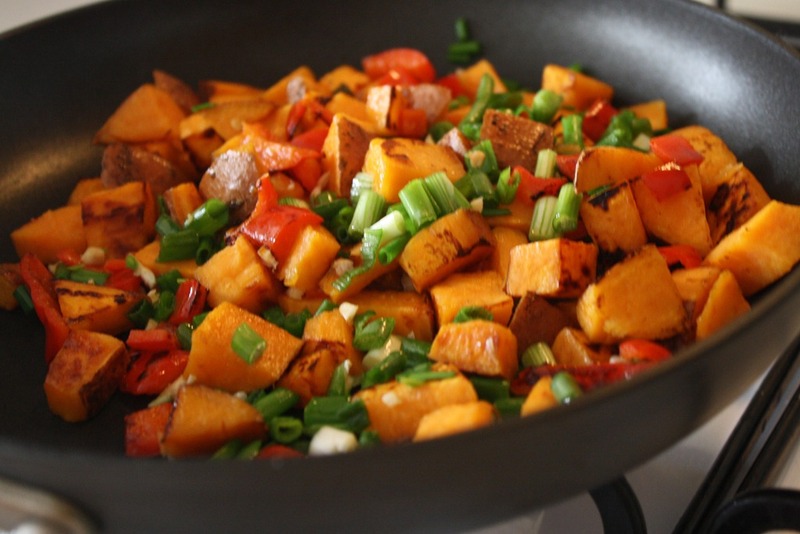 This entry was tagged bell pepper, breakfast, coconut oil, healthier, morning, potato, red pepper, scallions, sunday, sweet potato, vegan, vegetarian. Bookmark the permalink. Sweet potatoes are so pretty 😀 I would love these with an egg over easy and fresh fruit for breakfast! 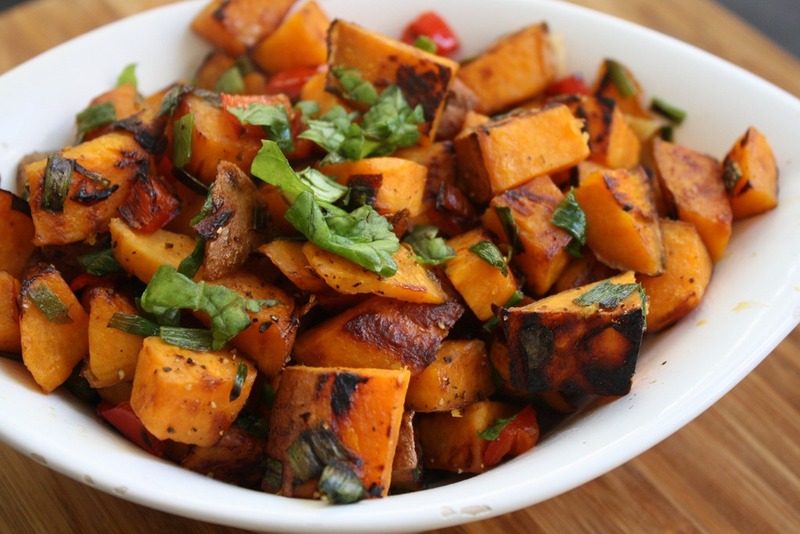 I LOVE SWEET POTATO HASH! 🙂 I have a recipe for my version on my blog with brussels sprouts and then I cracked an egg over it with a runny yolk 😉 Yum! Sweet potatoes are a staple in my kitchen too. It’s sad all the crazy things people add to them (tons of sugar! marshmallows!) when they are so sweet and perfect as-is! 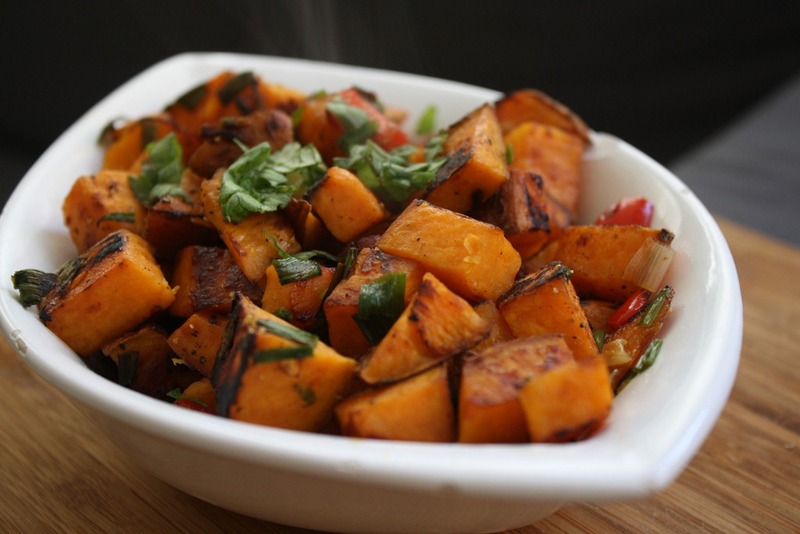 I read an article about an asian in the far east where a purple variety of sweet potato is a staple food, and the people of this island were so young looking with amazing skin.